Will hold up to approx size 12 adult Skates. 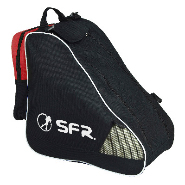 This superb bag is constructed from Heavy Duty 600D PVC water resistant material with embroidered logos. Features include internal base board for structural strength, air cycle vents, plastic feet on the base and shoulder carry strap + carrying handle. Seperate zip up compartment on the back to put you bits in! Will hold up to size adult 12 skates.